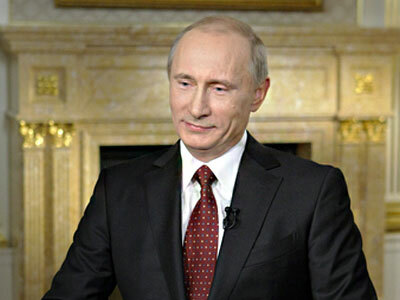 Russian President Dmitry Medvedev has given an interview to the heads of Russia’s three leading TV channels on Friday. The conversation covered the key events and issues of 2010. ­The president’s review of the year is now an annual tradition following the first in 2008. In this speech, Dmitry Medvedev presented his list of most important issues that Russia encountered in 2010: the growth of the economy, children’s problems, the summer forest fires, the upcoming ratification of the New START nuclear weapons treaty with the Unites States, and finally, the 65th anniversary of victory over Nazi Germany. Watch the full video of Medvedev’s year-end interview here! “I will name five major events. We did not downsize this year, we grew and developed, in spite of problems, imperfections and drawbacks, we grew pretty steadily,” Medvedev said, pointing to the fact that Russia demonstrated a 4 per cent increase in GDP in 2010. Indeed, a vast part of Medvedev’s Federal Assembly address was dedicated to means of improving the current state of children’s health and safety in Russia, as well as to social benefits for families with many children. “The third one is weather-related problems; fires and abnormal climatic conditions that rocked our country. It was a very difficult situation, psychologically and physically,” Medvedev said, referring to the devastating wildfires that hit Russia this summer. The fires killed more than 50 people, left several thousand homeless and caused around $400 million in damages to the economy. “I am very happy that we are making progress in ratifying this document,” the president said. Medvedev highly praised President Obama personally. “President Obama did a very good job. Under difficult conditions he managed to make the Senate ratify this document, the New START treaty,” he said. “It is very easy for me to work with President Obama. He really listens to you. He has no stereotypes. And, what is most important for a politician, he keeps his word,” Medvedev added. Medvedev’s comments on the New START came the next day after US Senate finally ratified the treaty after months-long debates. Once the treaty is ratified by the Russian Parliament and Medvedev himself, Russia and the United States can begin to make cuts in their nuclear stockpiles. 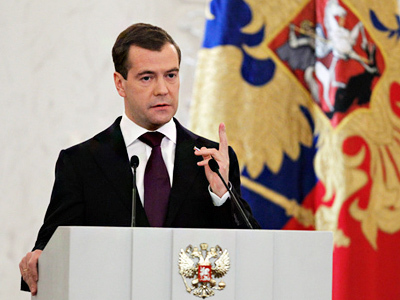 “Finally, I cannot but mention the 65th anniversary of Victory Day,” Medvedev concluded. Among other notable events and issues discussed during the interview were WikiLeaks’ revelations, the Khodorkovsky case, freedom of the media, the fight against corruption and recent spy scandals. ­With all the hype surrounding the publication of US diplomatic cables by WikiLeaks, the Russian leader was naturally asked to comment on the situation. When asked what he personally thinks about the documents made public on WikiLeaks, Medvedev said that some of them are “curious”. 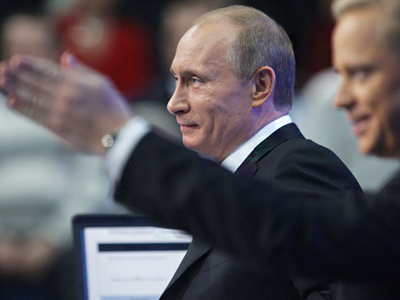 The Russian president says he is not afraid of any information published on the web. “If I were afraid of what people write about me, I’d never go on the Internet or watch TV,” he said. ­In an unexpected twist, Dmitry Medvedev turned the tables and interviewed his three hosts about freedom of speech in Russia and the criticism TV channels face for alleged self-censure. The heads of major Russian TV companies said there was no dramatic fallout from it at the moment. “I understand the nature of the claims, but still television is not limited by any dictatorship, not limited by censure. In this, Russian TV is no different… from the TV of major democratic countries,” said Konstantin Ernst, head of the Channel One. Medvedev agreed that Russian television is free, but nevertheless criticized it for being somewhat detached from the issues that are important to the people. “TV channels themselves should choose their priorities – what’s important, and what is less important. But the agenda should not be dramatically different from the Internet and other media. In my opinion, that’s how things look today,” he said. Of course, the relative importance of events is subjective, Medvedev added, and while one person sees the WikiLeaks revelations as the most important issue, another will be more concerned with the snowfall in St. Petersburg. ­During the interview, Medvedev expressed his vision on the Mikhail Khodorkovsky case. According to the president, there is no reason to suspect justice is being selective, because so far there has been no evidence of similar crimes by other persons. "I shall say as president: neither the president nor any other person who is in the public service has the right to comment on this specific case prior to sentencing," Medvedev stressed but added, "As for my position as a lawyer, lawyers operate within a space of what is possible. If there is evidence that other persons have committed similar crimes, then where are the initiated proceedings over such offences? If such cases do not exist, then why are we talking about selective justice?" Corruption and the means to tackle it were also among the issues discussed. Medvedev acknowledged that it is a relevant issue for Russia, as the country is “sick with disregard for the law." "There has never been trust in the law or in court here, people only believed in a good tsar and force," he explained, adding that it is vital to "do everything possible to raise the authority of the law." "People should obey the law not out of fear, but because it is deemed unseemly to violate it," he said. This goal cannot be achieved in a short period of time, believes Medvedev, as surgical methods are ineffective in this case. What is most important is that officials should serve as a good example, stressed the Russian leader. According to Dmitry Polikanov of the United Russia party, the ruling party is following Dmitry Medvedev’s lead in eradicating corruption, working towards making the party’s work as transparent as possible. ”Another example of how we act against corruption is the story with the mayor of Petropavlovsk-Kamchatsky, who was expelled from the party because of his inability to meet the concerns of the citizens and to work efficiently for the sake of the city,” Polikanov added. It is vital to find out the reasons behind actions of those investigating officers, who released two participants of the brawl that resulted in a death of a football fan Egor Sviridov, President Medvedev pointed out. “A criminal case was initiated in order to inquire why such decisions were made. It is not clear why the young people were released, as there was sufficient evidence that they were to blame for the murder,” stated Medvedev in his interview. 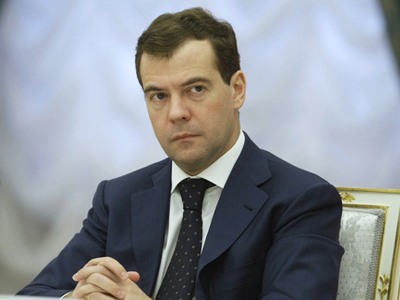 President Medvedev stressed that at the moment it is critical to know whether the actions of investigating officers were a case of corruption, or if they acted out of fear. Maybe there were other motives – this needs to be thoroughly investigated and understood. Once understood and proven, the investigating officers will be punished accordingly. The fight between football fans and natives of the North Caucasus took place on December 6. A 26-year-old man, Aslan Cherkesov from the Republic of Kabardino-Balkaria in the North Caucasus, who is believed to have shot Sviridov, was arrested along with several others. Later, all those detained except Cherkesov were released, which sparked mass violence when the general public learned about what they felt was an injustice. On the December 11, young people gathered in the heart of Moscow to protest against the way Sviridov’s case was being handled. What started as a peaceful commemorative rally was reduced to violence. Aslan Cherkesov has been charged with homicide, and two more people have been charged with instigating a fight in relation to the Sviridov incident. ­Medvedev also recalled the murder of 12 people in Russia’s Krasnodar Region, which shocked the country and uncovered a whole load of problems with corruption and criminal activity in the area. The president promised to deal with law enforcement agencies that turned a blind eye to the situation. Noting that Russia's federal authorities have been purged of criminal elements in recent years, Medvedev stressed that purges are still needed at the regional level, in order to clear power structures and the ruling political party of criminals. ­Asked what the main reason for the resignation of Moscow's ex-Mayor Yury Luzhkov was, Medvedev said: "It is the duty of any governor in the country to look after the territory he is responsible for," he said. Luzhkov, should have paid more attention to the problems of the city he was entrusted too govern, rather than “engaging in self-promotion and political shakedowns”, the president stated. "We all know and love Moscow – those who live in Moscow and those who come here on vacation. But this city has a huge number of problems: corruption on an unrivalled scale, even for a more-than-10-million-person megalopolis. An unseen scale," Medvedev added. Commenting on the political environment in the country, Medvedev urged all the parties and political movements to play a more active role in the country’s life. He especially stressed the great responsibility that Russia’s ruling party has in this sense. “Parties should be responsible about the power they've been entrusted with. Our main political force, United Russia, should not just reign, but govern with a smart, tactful and strong approach. It should promote the right people and remove corrupt, lazy ones. Other parties should be involved in discussing current issues and addressing them freely. Being in opposition doesn't mean being cut off from public life,” the president said. ­When asked about the the work done by the Ministry of Defense, President Medvedev said that in general he is satisfied, though the modernization of the Russian army requires a number of unpopular measures. “I think the ministry works hard. Certainly, just like any very big ministry, they make mistakes, but generally they realize the policy set by the Commander-in-Chief, that is, me,” he said. “The policy is to create a capable army. Our army, just like the police, unfortunately is still Soviet in many aspects. Not because the Soviet one was bad, the time was different, the country was different, and the challenges differed. We need to reform the army, and army reform is changing the staffing, cutting down on the number of officers and increasing their salaries,” he continued. The upcoming pay rise in the army is “radical”, the president said. By 2012, officers’ salaries will be comparable to those of their counterparts in other developed countries. During the interview Medvedev also revealed it was his initiative to admit that the ten agents of the Russian Foreign Intelligence Service arrested in the US were who they were, in contrast to the traditions of the Cold War era. “All people working for the secret services are first and foremost citizens of the Russian Federation, and not cannon fodder or heroes sent by the state to be sacrificed,” he explained. He added that Moscow will act in a similar manner again if one of its people gets into trouble. Medvedev also said having covert intelligence agents is a necessity for any nation with geopolitical interests. "Japanese should change their mindset on Russia and Kurils"
The row with Japan over Kuril islands was also among the hot issues of foreign policy discussed. President Dmitry Medvedev reiterated that Japan should understand Russia’s position that all the Kuril Islands are Russia’s territory. The Russian President’s visit last month to the Russian far eastern Kuril Islands sparked an outcry in Japan, as Tokyo views the islands as its historical territory. Medvedev pointed out that no other head of state has ever gone there, solely due to the remoteness of the islands, and noted the necessity of providing decent living conditions in the region. The President believes the Japanese should change their mindset on how they view Russia and the Kuril Islands and concentrate on economic matters. Russia is ready to co-operate with Japan, especially on joint economic projects, Medvedev said. He proposed the creation of a free-trade zone in the Kurils to boost economic partnership with Japan. “This is our land and we must develop it, however it doesn’t mean that we are not willing to work with our Japanese partners. 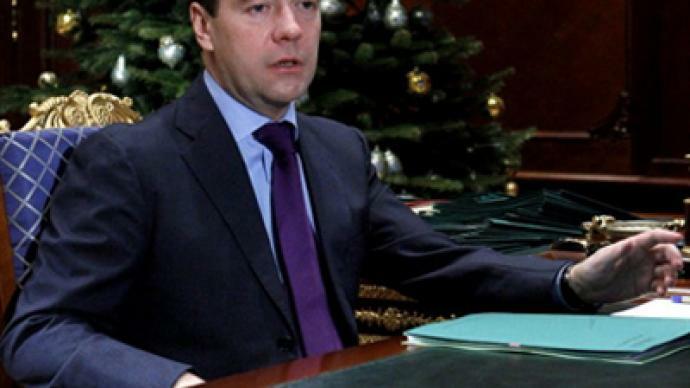 We are ready to work closely on joint economic projects,” Medvedev said. ­Dmitry Medvedev also recalled his personal experience related to the tragic crash of the presidential airliner of the Polish President this year. “Such news always makes one shocked and feel pity for the people who died. Here, virtually all Poland’s political elite died. And that place too. It’s something mystical,” he said referring to the site of the crash, which is close to Katyn, the scene of mass executions of Polish prisoners by Soviet secret police. The president added that the results of the investigation of the crash must be reviewed without politicizing the issue. Earlier, Poland refused to approve the report prepared by the International Aviation Committee. According to Medvedev, the move is probably based “on emotions; a reaction to domestic political turmoil in Poland”. “I hope Polish politicians will have enough resolve and wisdom to make the necessary conclusions without excessive political comments,” he said. When asked about the fate of the iPhone that he received from Steve Jobs this June during a visit to the Silicon Valley, Medvedev said that the device works and that he had given it to his son, 15-year-old Ilya. The Russian leader said he wishes he could spend more time with his son, so he is going to spend New Year’s Eve in the family circle. “New Year is a wonderful holiday. Of course I am going to spend it with my family, as is common for practically every family in Russia,” he said. He added that it would be a pleasure for him also, because his son will be with the family too. Medvedev expressed his regret he does not see Ilya as often as he would like. “So, let us not make him feel embarrassed – it is he who should decide,” the Russian leader said.